A federal appeals court in Washington, D.C. has sided with thousands of Vietnam War veterans who were stationed offshore during the Vietnam war and developed health problems linked to exposure to the toxic herbicide Agent Orange. The 9-to-2 decision reverses a decade-old ruling by the court and applies to an estimated 90,000 veterans Nationwide. A court majority said Congress clearly intended to extend benefits to sailors who were stationed in the territorial seas off the coast of Vietnam. The ruling means Navy veterans who served within Vietnam’s territorial sea will now be presumed eligible for disability benefits if they have one of the diseases that is linked to Agent Orange. 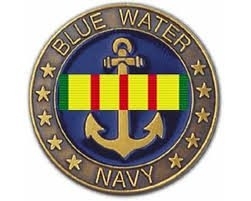 The federal court ruled that the Department of Veterans Affairs (VA) cannot deny disability benefits to Blue Water Navy veteran anymore. But, in the meantime, Blue Water Navy veterans are encouraged to file a disability claim immediately if they have any of the ailments linked to Agent Orange. Elizabeth is a USVCP staff writer.